I have always been a big fan of the consistently high quality beers that Brew Boys produces. Two months ago I walked for an hour in the the winter rain to the Local Taphouse in Darlinghurst to grab a pint of the Ace of Spades while they had a Brew Boys showcase on, and given the weather this beer didn’t disappoint one bit. The only problem was after tasting it was how was I going to get my hands on some more of the stuff? Luckily a friend had a few bottles spare so I was able to taste again and give it a proper review. Winter has well and truly arrived here in Australia with its cold winds and frequent rains, relief is thankfully on hand though with the release of Maltida Bay’s latest seasonal named “Longshot”. Its inception came after Matilda Bay head brewer Scott Vincent and gourmet coffee roaster Toby Smith started comparing stories about roasting malt and coffee beans over a beer. Premium Thai beer Singha is bringing back the SinghaBar competition for 2010, which will see offices around Sydney kick off Friday night drinks and help say farewell, or ‘sawadee’, to the past working week in true style. For a chance to be the most popular person in the office, eager workers need to visit www.singhabar.com.au and describe a time they have been ‘transported’ in some way (mind or body) from their workplace. The most interesting answer will win a Friday office visit from the SinghaBar, fully stocked with cold Singha beer and accompanied by some Thai style nibbles. The SinghaBar will make nine weekly office visits each Friday from 16 July, to winners who have entered via www.singhabar.com.au. The prize provides a fresh and fun way to celebrate the end of a hard week at work with a cold Singha beer. Inspired by the concept of being transported, the SinghaBar reflects Singha’s sense of travel and adventure. The mobile bar draws its influence from a luxurious travel case, yet is tough enough for a typical Friday scene of revelry. Each week the Winning offices will be notified on Wednesday and can expect the bar to arrive for Friday festivities from 4pm. On their inaugural visit to Australia, Lord and Lady Hendrick’s undertook an anthropological adventure to spread the word of Hendrick’s Gin and to acquaint themselves with bartenders in Brisbane, Melbourne and Sydney. Throughout June, they visited more than 77 bars and met over 90 bartenders along the east coast. 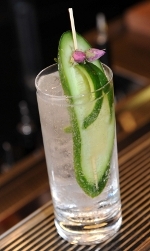 Each bar was judged on their presentation and mixology skills of a Hendrick’s and tonic as well as their brand knowledge. The top scoring bar in each state won a sunrise hot air balloon experience for six people. The prizewinning purveyors of the peculiar, otherwise known as Hendrick’s Gin, were Zeta Bar, Gin Palace, X&Y Bar and Libertine. The Matilda Bay Brewing Company has recently teamed up with the gourmet coffee brand Toby’s Estate to create their latest limited edition beer for this winter called Longshot. Born over a beer between Matilda Bay head brewer Scott Vincent and gourmet coffee roaster Toby Smith after comparing stories about roasting malt and coffee beans, Scott and Toby sat down with a selection of Toby’s best coffee beans to determine which would be most suited to Matilda Bay’s new coffee infused beer. Longshot is a spiced, full-flavoured dark ale with notes of coffee and malt balancing to finish with a subtle hop bitterness. Beer drinkers will also enjoy a number of different roasted malts in Longshot. These give the beer wonderful flavours of toffee and chocolate that perfectly complement the coffee notes. Longshot also uses an ale yeast fermented at moderate temperatures which gives it a lift in the ester profile – the fruity character that’s found in some ales. With a coarse grind of the coffee beans and a cold extraction, the coffee was then added to the fermentation process and was carefully managed to keep the beer balanced. Longshot is a challenging beer for the discerning beer drinker and is an ideal beer for food matching particularly with chocolate dishes and beef. Try Longshot with chargrilled Scotch fillet on a rosti stack with thyme mushrooms and sautéed spinach or 70% Belgian cocoa chocolate (the bitterness balances wonderfully with the coffee notes in the beer) in a decadent dark chocolate and pear tart. Longshot will be available only from Dan Murphy’s from 1 July 2010 and will be a limited release while stocks last and with only 5,000 cases of Longshot being produced, beer lovers will need to get in quick to sample Matilda Bay’s newest brew. Burleigh Brewing Co. My Wife’s Bitter. Pale amber colour. Light toffee, toasted bread aromas follow through on a soft, supple entry to a dryish light-to-medium body with great balance and subtle hops on the chewy malt accented finish. A great interpretation of an English mild with a touch more sweet malt and spot on hops. Burleigh Brewing Co. Duke Pale Ale. Brilliant amber colour. Nicely balanced toast, praline, and citrusy hop aromas and flavours on a crisp medium palate with a long, refreshing lightly piney hop finish. A spot on American style pale ale with seamless balance and an attractive fresh hop character. Founded in 1994 the World Beer Championships is one of America’s oldest international beer competitions and was started by the Beverage Testing Institute (BTI). Beers are rated by judges using blind tastings on a 100 point scale and accolades awarded to brewers using a medal based system.